Forest Green Rovers are ranked 94th in England after the 2015/16 season. In simple terms: they came 2nd in the 5th league, being just two spots away from reaching professional league level. No wonder they’re not the most covered club in England, but that said, FGR made headlines several times in recent years. Majority of the team’s shares was acquired by David Vince, owner of Ecotricity, a renewable energy tycoon. Vince aims at making Forest Green Rovers a global showcase of ecology and sustainability, even if he wasn't behind the club's relocation from the Lawn to the New Lawn in 2006 (seen below). This is where the cow manure comes in, because in 2011 Vince proposed for the field to become fully organic. Since there were no specific criteria for what might be considered organic, the decision was followed by consultation and eventually Rovers went back to using cow manure as the sole fertilizer for their field. Within 2 years any and all chemicals remaining in the ground were considered gone and turf quality is fully satisfying, even if it comes with a smell. Along the field FGRFC also became the first English team to exclude any meat from their matchday/event catering, going vegan eventually. Of course these steps received significant publicity, but they changed little within the stadium itself. Now, after a few upgrades the New Lawn ground uses solar power for 10% of its use and reuses rainwater. These may be considered innovation at 5th league level, but are fairly common worldwide nowadays. Next was supposed to be LED lighting, but to date the club haven’t introduced it. According to official information, current LED technology is still too energy-consuming to be part of the stadium. Despite numerous attempts the New Lawn is still a fairly regular stadium structurally. Now Forest Green Rovers go further, especially that the current ground won’t be sufficient for long, should they win promotions as planned. In March the club announced its international design competition, challenging architects with designing the most ecologic and sustainable stadium to date. With minimized carbon footprint and invitation to provide innovative solutions comes a massive budget of £100 million ($130 million currently, following Brexit). 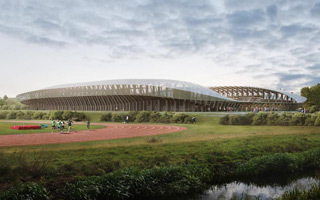 The stadium will be built along with a vast leisure and training complex beside Junction 13 at the M5 motorway. That’s nowhere near the current stadium, some 9km (6 miles) north-west. That said, the 40-hectare (200-acre) site will be much more accessible in the selected location in Stonehouse. This way a 5th league club managed to draw interest of the top architects across the United Kingdom and beyond. Their 5,000-capacity stadium (though with expansion to 10,000 already anticipated) was created almost 50 times, in entries from around the world. In late May a shortlist of 9 architectural firms received further guidelines for their entries, while this week the final list was presented. There are two finalists, Zaha Hadid Architects and Glenn Howells Architects. Two further companies were commended for their great work, even if not going through. We’re presenting one of these concepts today, by George King Architects. Now the two finalists will continue working on their drafts until September, when the final concept will be selected.